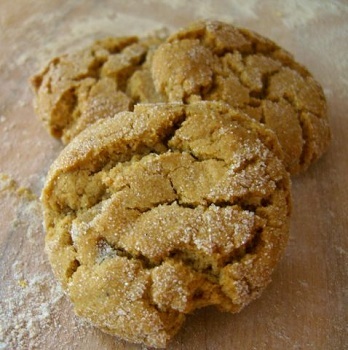 Gingersnaps are a favorite holiday cookie. Their spicy sweetness just seems perfect for the Christmas season, when the weather outside is brisk and a little spice always has a way of warming things up. These Gingersnaps with Crystallized Ginger are a classic gingersnap cookie, made with plenty of molasses and spice. I added some chopped, crystallized ginger to give their ginger flavor a little more oomph! These cookies also have a great texture to them. They’re chewy at the center and crisp around the edges, without being hard or heavy, like some molasses-based cookies. They loose a little of their crispness after the first day, as the molasses draws extra moisture into the cookies (which actually helps them stay fresh longer! ), but they stay nice and chewy. Also, as they sit for a day or two, the spices blend together and the cookies end up tasting even better. This dough can be made in a slice-and-bake format if you prefer, but I like doing these as drop cookies because they have a prettier final appearance and, though the sliced ones remained a bit crunchier even days later, I really like the chewiness of the hand-formed cookies. Refrigerating the dough in its bowl for about 30 minutes gives it a chance to rest and evenly distribute the moisture, making it easier to form into balls. In a large bowl, sift together flour, baking soda, salt, ginger, cinnamon, cloves and black pepper. In another large bowl, cream together butter and sugar until light and well combined Mixture will be grainy. Beat in the eggs eggs in one by one, followed by molasses, balsamic vinegar and vanilla. Working by hand or with a mixer on low speed, gradually stir the flour mixture. When just about all of the flour has been incorporated, add in the chopped ginger and stir until no streaks of flour remain and ginger is well-distributed. Chill dough in the refrigerator for 20-30 minutes. Form dough into 1 inch balls, roll in extra sugar and place on baking sheet. Press cookies to flatten slightly. Bake for 10-12 minutes at 375, until lightly browned around the edges. Allow to cool on baking sheet for 2-3 minutes, then transfer to a wire rack to cool completely. OMG… these are going in my christmas cookie tins.. I love ginger snaps ..
My Christmas cookie doughs are already prepared. At the last minute I added a rolled spice cookie (which I’ve been nibbling raw since last night). Thank god for your recipe index, nic, ’cause I know I want to come back to these later. We’ve practically been making ourselves sick by eating too many Double Ginger Crackles from Fine Cooking. They are very similar to these, crystallized ginger and hand rolled. Oh, these are another ginger cookies!. They look yummy. I made your spiced up ginger cookies yesterday. Of course they are fabulous. I wonder the taste of these ginger cookies becase of more little ground ginger and balsamic vineger. LOVE LOVE LOVE ginger cookies! These are going on ly list of cookies to bake! Great post! Do you think ginger could be one of those things like dark chocolate that need older taste buds to fully appreciate? I used to just hate ginger and heavily spiced pastry. Now I love it and nibble on candied ginger. Anyone tried The Ginger People’s stuff? Those Ginger Delights are sensational. Hi Rainey. I love the Ginger People’s candies, too. I usually have a bag stashed away in my glove box for long commutes. As though there are short commutes in LA…. nic- I’m thinking your talking about the paper-wrapped chews. Look for the Ginger Delights at Whole Foods. They’re soft gels with a subtle ginger flavor. They’re super. ….except that you’ve got to wipe off a half ton of powdered sugar and still need a bib to eat them unless you want to be lookin’ like you’ve got a substance problem. ;> Definitely NOT car food but yummy nevertheless. yum!! I absolutely adore gingersnaps. I haven’t used crystallized ginger before. I’m dying to try it. I bet these are fantastic!! LOVE crystallized ginger and, indeed, anything made by those wacky Ginger People. Lovely cookies. Hi Nicole! I’ve been constantly eyeing your blog and since I just started mine a little while ago, I thoughtI should also start posting on other’s blogs too – especially when I have inquiries. I’m prepping for Christmas baking (woo!) and finally settled on a cookie selection to send to my friends and whatnot. I’m not sure if I should do a gingersnap or a snickerdoodle. I was always fond of gingerbread and making plain ol’ gingerbread men were boring. If I were to do a gingersnap, I want to add something too it..but I don’t want the ginger to be too pungent. If I were to add the crystalized ginger on top of the cookie, it wouldn’t take over in flavor, would it? These are fanstastic. My husband said, “Best cookie I’ve ever had.” Next time, I think I’ll add more crystallized ginger, however. (I’m a ginger addict). Thanks for the recipe!